-some guy that hasn’t read this article yet. Late? Or early? No, I think I’m proceeding right on track here. We’ve grown accustomed to the 24 month life cycle of Standard. When Theros hit store shelves, we knew that we could settle in for the long haul because this was going to be a part of Standard for TWO FULL YEARS. We also knew that one year into that two year term that Theros cards would likely hit their all-time high price as Return to Ravnica block rotated out and Khans of Tarkir rotated in. Timing this price point was a time-honored secret for success for a long long time. We used to watch Block Constructed results from Magic Online and at the Pro Tour to help us determine which cards were going to be exceptionally powerful going forward. While these results helped us hone in on format superstars like the “Mythic” deck during the tail end of Shards of Alara Standard, most of these picks were painfully obvious like Stormbreath Dragon or Elspeth, Sun’s Champion. We knew to pick up Elspeth’s when they bottomed out at $20 because we could easily unload them at a higher price once Khans of Tarkir was released (ended up being at $30). We also knew that the back side of that last year was a slow slide from the price peak to basically nothing. Your Theros cards are worthless. Yes, basically all of them. Arguments can be made for cards like Sylvan Caryatid and Courser of Kruphix in Modern, but let’s not get too carried away because these cards certainly don’t see anything resembling “regular” play in Modern and there’s a metric ****ton of them in the wild right now. But Theros is not what I’m talking about. I’m talking about Khans of Tarkir and Fate Reforged. Something that nobody’s really mentioned yet is the new economics of rotation. As Theros and Magic 2015 rotate in September at the release of Battle for Zendikar, Khans is already going to be rotting in your binders. Why’s that? Six months to live. Yeah, that’s a thing. You might not realize this, but Khans of Tarkir was born with a birth defect common to all sets going forward: a shortened life span. While many of it’s ancestors lived to the ripe old age of 24 months, Khans is only going to see 18 and Fate Reforged is going to fare even worse: 15 months. So that means we need to rethink cycles and card prices and we also need to acknowledge that in relation to when Khans is rotating, we’re already past the traditional “peak” of one year before rotation. … but not as much as they used to. Some of you may not remember this, but PTQ season formats had a real impact on card prices. Back when Extended was a thing for three months a year, there was a massive sell-off at the end of every season because these cards were simply useless for 95% of the population for nearly an entire year… could be longer because we didn’t know when a format would come back around. Right now we’re in the middle of a PPTQ season that’s featuring Modern. This means that outside of Grand Prix’s and the SCG Open Series that there is little reason to keep an arsenal of competitive Standard cards, and many of the prices already reflect that sentiment. 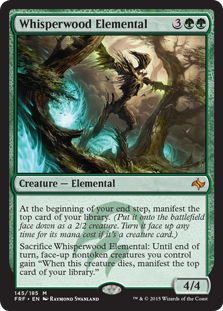 Take a look at one-time all star Whisperwood Elemental, this card has nearly halfed in value since it’s peak in March ($15-$8). 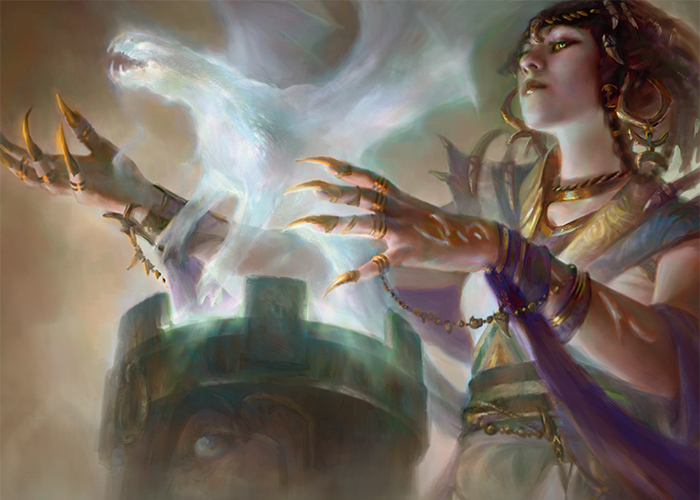 I would be doing a disservice if I didn’t point out the obvious: there’s only so much money available in the Magic economy at any given time and Modern Masters 2015 is drawing a lot of that water right now, both directly and indirectly. There were a lot of pent up desire for Modern cards. Many players were waiting for this set to “make their move” into Modern and they’re coming on board in large numbers, which is one of the primary reasons so many card prices are going ape right now (pro tip: it’s not speculators). With MM2015 on the horizon, many of Modern’s card prices “locked in” because of the uncertainty of what was going to be reprinted. Nobody wanted to go out and drop $200 on a Tarmogoyf if it was going to get reprinted in a couple months. If Tarmogoyf was confirmed early to not be in MM2015, we’d probably be looking at $250+ Gofys right now, but that impending reprint kept that price in limbo. You can repeat this example with just about any card that’s gone up in the last month. Pro tip: it wasn’t a spike, it was a correction. Ahh, finally we get to the reason for all these words: some of your Khans block cards are already dead and should be abandoned ASAP. Like what? Like Dig Through Time for example. This card is the unbending backbone of blue decks in Standard. Dig is amazingly powerful, which is why we’ve seen it banned in Modern and watched as it makes a really strong case for being banned in Legacy as well. What’s that mean for those Digs you’re sitting on? 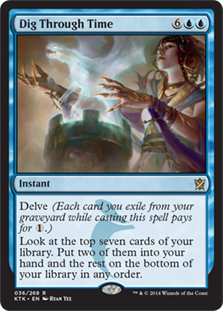 Dig Through Time is going to be a bulk rare in the very near future. There are roughly a billion-kajillion of these in existence and anyone that needs them for Legacy already has them. Sure there might be some casual demand for this card in Commander, but it’s power is diminished substantially in 100-card singleton formats. Whisperwood, as mentioned above, has fallen from grace. This card is clearly awesome, but it just exists in the wrong space and time. There is virtually zero chance this card sees Modern play after rotation as it’s simply outclassed by cards like Thragtusk. Legacy? Not a snowball’s chance. There’s also just too short a window for this card to curve out. While there’s sure to be casual appeal for this card for years to come, it’s not going to be enough to sustain a price above $3-4… if that. So this should be worth a million dollars right? That’s what we thought when he first showed up. We quickly figured out that he’s not really good in Standard and his price reflects it. 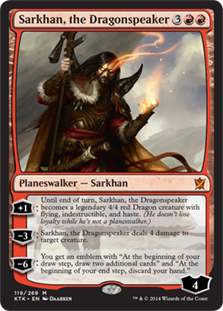 Sarkhan, the Dragonspeaker is hovering around $5 solely because his card says “Planeswalker” on it. This is not going to show up in competitive decks past Standard so that demand is going to be tied to casual demand only. The good news is that he’s unlikely to go much lower without a Duel Deck appearance, but he’s almost certainly not going to go rise this fall. 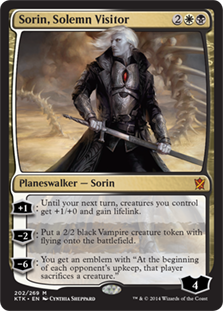 Sorin, Solemn Visitor has a much better chance of mounting a slow and stable recovery as he’s replaced his previous self in all those B/W token decks in Modern. He’s still at a great risk of a Duel Deck reprint thanks to being a vampire and that whole tick craze still sputtering along. But how has Sorin fared in Standard lately? Yeah, exactly. Not exactly inspiration for a big investment. This is another card that’s not going to tank outside of a Duel Deck reprint, but it’s going to be a slow climb moving forward. Anafenza, the Foremost is still a card that I feel suffers from “too much textbox syndrome”. People just forget that whole secondary clause about exiling creatures instead of allowing them to hit your opponent’s graveyard. I was very bullish on Anafenza as a Modern contender because she did a great job of hosing many of Birthing Pod’s shenanigans while still being a fairly insane addition to basically any Abzan deck that attacks with creatures. But as Fleecemane Lion leaves Standard in search of a new mane wig, Anafenza is going to be left behind with a short window and few allies to help her prove worthy of a higher price. 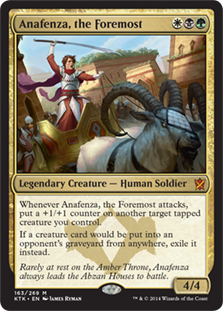 Anafenza’s likely going to pull an impression of Thalia, Guardian of Thraben in Modern and possibly Legacy, only showing up in niche scenarios as an oversized hatebear. I’m not going to be surprised to see these as low as $2 by / after rotation. In case you haven’t figured it out yet, Brutal Hordechief isn’t Hellrider. You can spend the rest of your life looking at the text box trying to figure out how this card never became a thing, but my bet’s on the fact that it’s a Hill Giant and nobody likes a 3/3 for four mana. You can lump Shaman of the Great Hunt in with Hordechief as a promising young athlete that failed to make it big in the NFL because they got drafted to the Lions or the Raiders. The lack of compelling teammates doomed both of these cards to mediocrity and there’s no chance for recovery. These are already on the cusp of bulk Mythic and I expect to them to retire as such, maybe they can open a car dealership or something. Do you know what a $1 board wipe looks like? It looks just like a $6 board wipe except it’s rotated. There is not much hope for Crux of Fate after rotation because in a vacuum it’s pretty crappy compared to cards like Supreme Verdict or Damnation. These are already slipping as people figure out that playing mirror matches in the draw bracket all day is the very definition of Standard Hell, but you can still get out at $3 if you want to save a little of that value. Obviously the fetchlands are pure gold. they’re going to retain the bulk of their value and continue to grow incrementally going forward. Tasigur, the Golden Fang, Monastery Mentor, Soulfire Grand Master, and Ugin, the Spirit Dragon are basically the only rares outside of the fetchlands that I don’t see cratering as they leave Standard. Even Siege Rhino is struggling to hold onto that $5 price tag and he was an absolute BOSS. If you have Standard cards that are worth more than $1 that you are not going to need in the next nine months, it’s time to ship them. There’s a very short window for recovery and most of these cards are unlikely to be lifted by it. Except for maybe See the Unwritten – ELDRAZI!!!! edit: I think people were missing the point of the article by a fair margin. I’m not saying that all of these cards are worthless now, I’m trying to point out that we have a new rotation starting with this set so we’re likely to see things behave differently this time around and you will not have as much time to divest from Khans block as you have had in the past. Couple that with the reality that most of this block has no life past Standard, you’re in for some Temple of Epiphany sized losses if you don’t plan ahead. Khans/FR will be in until Spring of 2016. You really think from sept to that time none of those cards will spike? Winter is prime time magic playing time. Sure we lost 6 months but things still rotate and we only gain 1 set making khans block the primary building block sets. I do agree with some of your single card calls as crap but mostly because better cards have been printed. This is new territory though so time will tell. Eh. I wouldn’t read much into it, Derek is big on the hyperbole. He’s got a point, but don’t think his strong emphasis is a strong opinion – that’s just how he writes. I think the cards will only make modest gains as people will be even more hesitant to buy into the “fall spike” as there’s a shortened window. To be fair, winter is when card prices are at their lowest point. I don’t quite think relying on any winter play is a good idea for investment purposes. You and Travis are on opposite ends of the spectrum when it comes to Sarkhan. He called it a good buy about 45 days ago. Would like to see the two of you debate this. Won’t people have to buy cards or cards will spike as new decks emerge when Theros block leaves? Let’s hear a rebuttal rather than snarky comments? How am I terrible with this one? I didn’t make the original comment, but I’d ask you to post some sort of reasoning or evidence in the original article. Justifying your reasoning in the comments is lazy, your justification should be in the article, and should include something more than hyperbole. 1. 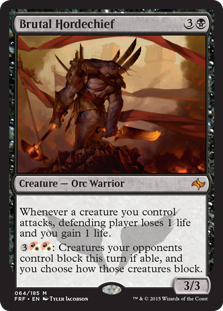 Sarkhan is a bad card, he’s a mediocre removal spell OR a creature that can be attacked, neither are something I’d want to play with. 2. Khans was opened in record numbers to get fetches, this depressed the value of almost every other card in the set. 3. People will “have to” buy cards as new decks emerge, but the bulk of these cards are readily (excessively) available at all the major retailers because so much of the set was opened, and so man people traded in Standard cards to grab those last few cards for their Modern decks. 4. The major players are already known and the bulk of those cards are already owned by players. Why isn’t this in your main article? I mean, it is, sort of, but if you’re upset that people are missing the point of your finance article because of your witty observations, maybe your article shouldn’t be labelled as finance. this comment was True for RTR or any other set really (maybe not opened in the amount that Khans was opened but still A LOT) and yet we saw for example Jace go from 6$ to 30$ it was only for a few weeks but i was able to buylist 35 them to T+T for 25$. Cards spike PERIOD price usually sticks for maybe a week or two as retailers hustle to refill there stock after a big tourney report comes in but there is always a window to lock in great profits. This is by far one of the dumbest things I have ever read. MOST players can’t afford to keep 4 ofs of everything they sell to make new decks usually at buylists and lose dollars everytime. When sets rotate a new deck emerges and everyone is trying to get the stuff for it and GUESS WHAT prices spike for a few weeks and tail off slowly as new decks emerge. This is basic simple MTGfinance. These comments and your article show you have no clue how mtgfinance works or how price spikes work. Also it shows you do not play AT ALL and have no idea how hard it is for players to get cards. PLAYERS ARENT SPECULATORS. I like the article and believe the point is spot on, but the timing is not. I’m partially on the boat with Dave up top. I think that certain cards will spike at rotation, similar to how Theros cards spiked when RTR left. When Theros leaves and BFZ enters, its a brand new format. People will rush to build the new best decks that pop up at that weekends SCG open. It happens every time. I think the time to sell Khans cards will be the couple weeks after BFZ releases. So you think that the shortened lifespan will have no effect on prices? At the point you are making? Not really. My point is there will be a spike of KTK at BFZ release, and therefore now is NOT the time to be selling. Your point seems to be “sell everything now since its a shorter lifespan and therefore wont be worth as much for as long”. I’d argue that the shorter lifespan really does nothing except move up the exact same timeline that would have already happened. That timeline being high at release of current set, low points before new set and rotation, spike when new set with rotation comes then gradual drop off until rotation of current set. Also, we get a rotation twice a year now and not once a year, so the “spike when new set comes out with rotation” will be every 6 months instead of 9-12. More money to be made. Hyperbole begets hyperbole I guess. I too disagree with some points in the article, though I think these comments are really extreme. I enjoyed this piece in spite of not completely agreeing with it. I think your point about shortened rotation is fantastic and worth pointing out. That said, I think you’re overestimating the importance of it. As Nick pointed out, when BFZ comes out (and, Origins perhaps) I fully expect we will see the usually price jumps, because this game is still played by people, not just speculators and #mtgfinance gurus. I faced this problem back when I started playing but didn’t pay attention to prices much. The core set would inspire a new meta and I would buy into a deck or two months before rotation. That was obviously dumb but I know others have this same perspective even now. That’s just talking about buying into decks with pieces about to rotate on a normal schedule. I think this new rotation schedule will be way more under the radar for regular players and people will treat the fall release with little more trepidation than any other fall release. TL:DR Old habits die hard. Thanks for disagreeing in a reasonable manner! Okay, so some people said they disagree, but with what exactly? I highly think that Tasigur and Siege Rhino have room to grow. This is based on my anticipation of Languish being a meta-changer. And the best deck to utilize this card is Abzan Midrange right now. Sure, it also ends Fleecemane Lion’s monstrous life, but Tasigur and the Rhino will still be there. Few things dominating the meta right now that can resist this. GW company? Well, kind of, since the Den Protector/Deathmist Raptor engine is real (Den Protectors should all just be Exiled!!). Esper Dragons? Without Ojutai it is probably a bit hard for them, but they may have enough counters if they didn’t spend them on your Rhinos and delved Tasigurs yet. Atarka Sligh? Nope, not a single one. UB Control? Pretty unaffected, but they lose to Abzan already in about 52% of the case (I’m basing this on a recent mtggoldfish article by SaffronOlive). Abzan clearly gets a new toy to annoy others with. And maybe there is a new UB brew possible (with Sidisi, Undead Vizier, Dragonlord Silumgar, Gurmag Angler, Tasigur and a boatload of removal). Anafenza’s casting cost is very prohibitive, even for eternal formats. I don’t see her mattering at all past standard. I think Rhino is a card worth holding, because its price will not fall much after rotation. Tasigur, Mentor and Ugin are all legit though, and definite holds. Monastery Mentor is already being played in Legacy Miracles which isn’t going anywhere. Derek I think you are mostly right and I appreciate your opinion…but it’s an opinion and if people don’t want to listen to you they don’t have to. I like your perspective that these cards have a short lifespan and if you want to save money get out now or October is smart advice. I think you harshly evaluated a few of the cards and I do think there is going to be a significant Elspeth or Xenagos type spike for some of these standard cards like Whisperwood, maybe Shaman of the Great Hunt, Crux, and few of the other Fate cards. Maybe cards like Anafenza, Mantis Rider, Knucks, Rhino, Butcher get a bump when devotion (Nykthos, Polukranos, Xenagos, Gen Hydra, Hornet Queen) and Stormbreath Dragon rotate out. I definitely think the Fate cards have a better chance to spike due to lack of availability vs. the Khans cards that are in overabundance as u stated. I wouldn’t be surprised to see Whisperwood and Mastery both spike again in the fall as people go back to stupid but powerful strategies. Sarkhan is NOT as bad as you state, and when Stormbreath rotates out I think he will be a 2 of in GR dragons or Mardu dragons decks come the fall, so if you can get him for $5 now why wouldn’t you?? Xenagos was in a similar spot last summer and was bought out and spiked to$17 if I remember correctly…and Theros was a highly produced set. 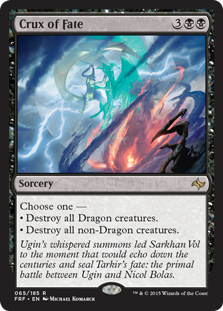 With Languish being printed in Origins I think it really gives Esper Dragons a tremendous boost and that deck will see even more popularity as Languish can board wipe the aggro decks and Crux can handle the mid to late game when you have your Silumgars and Ojutais online. Also, why do you feel Dig would be banned in Legacy? I’ve played with it and it’s broken in OmniTell but other decks it’s mostly a very good card but not remotely broken. Wasteland is more format defining than Dig imo, so I am curious as to your reasoning there. Interesting how everyone is an expert, but only Mr. Madlem has to substantiate his points. Not saying I agree or disagree, only that I see the hypocrisy here. yes sir, your is crystal clear here… or maybe not at all… would you care to elaborate on why all the cards mentionned should spike at every next gp ? i am not familar with the field of gp yet it drives prices mad, so i d like to know what is your reasoning behind ? EDITOR’S NOTE: We welcome disagreement for the sake of discussion, but personal attacks will be deleted. Please, everyone, keep it civil. I skipped most of the comments, so apoligies if this has already been lifted. I was referring to the Khans of Tarkir cards not being worthless yet. Theros cards are in a freefall to the bottom right now.